This is another favourite dish of mine from my mom's kitchen. Seppankizhangu is a root vegetable, which is called as Taro Root in English. also called as Colocasia. 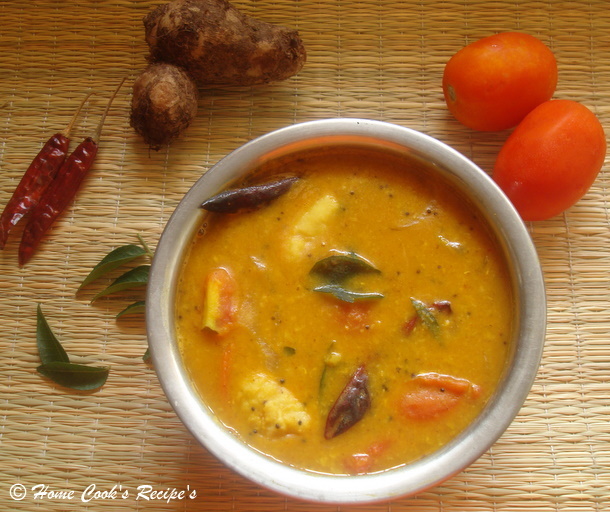 Seppankizhangu Roast is the popular dish, but i dont know, how preparing this sambhar came into practice in my home. 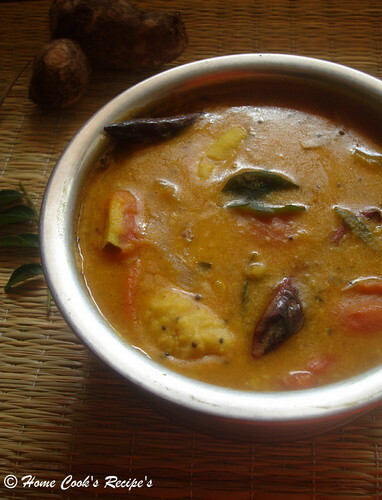 If you love Seppankizhangu, then you must try this Sambhar. the soft Seppankizhangu in Sambhar will sure impress you all. Is there any similar stories in your family? 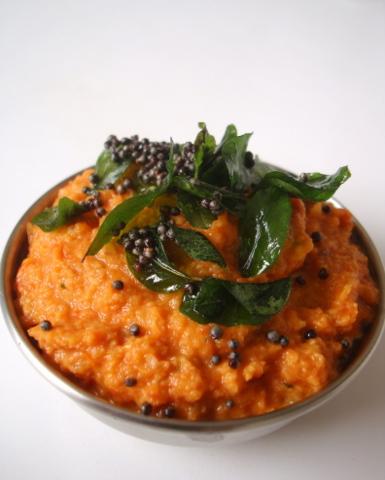 Cook the Tuvar Dal with a little asafoetida. If you Pressure Cook, cook it upto for 5 whistles. Cook the Seppankizhangu with little salt to taste in Pressure Cooker for upto 4 whistels. After Cooking the Seppankizhangu, wash them with cold water and let it cool and peel its skin. and set aside. Soak the Tamarind in warm water for about 5 minutes. In a Pan, heat oil, add mustard and let it pop and add, asafoetida powder, curry leaves and dry green chilli's. Add Diced onion to the Pan and saute it along. Add chopped Tomato to the Pan and saute it along onion. Now add salt to taste, add Turmeric powder, Sambhar powder and mix well. Add boiled and peeled Seppankizhangu to the pan and mix well. add tamarind water and 1/2 cup of water and mix well. let the Sambhar boil in medium flame for about 5 to 7 minutes. and remove from flame. * Add more water, if like your sambhar little watery. * Its must to add Asafoetida powder, as it helps to remove gas from the seppankizhangu. 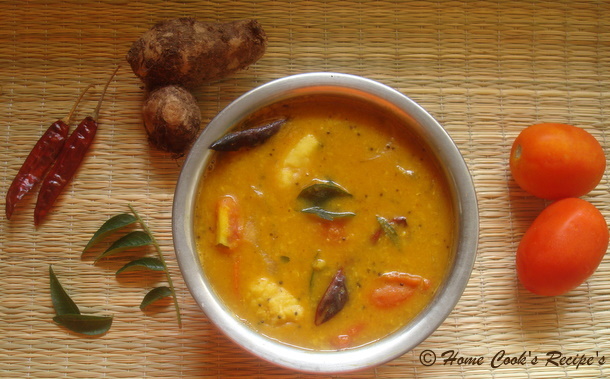 Serve the Sambhar with Hot Rice. some appalam or vadams will make a good combo. Temperature has dropped down drastically since last 48 hours due to Cyclone Laila. Cool weather prompted me to bake some eggless brownies. I more or less followed this eggless chocolate brownies recipe from Chow Times and it didn’t disappoint. 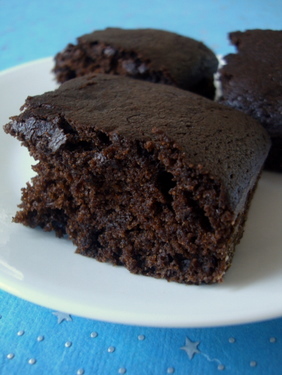 Rich, with melt-in-the-mouth texture, these brownies are to die for. 2 In a bowl, sieve maida, cocoa, powdered sugar, cornstarch, baking soda and salt. Keep aside. 3 In another bowl, combine melted butter, buttermilk and coffee mixture. Add the vanilla essence. 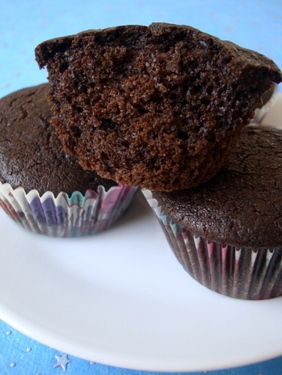 Mix in the cocoa-flour mix using a wooden spoon until no trace of flour is left. Spread batter into prepared pan. 4 Bake in preheated oven for 28-30 minutes. 5 Cool on a wire rack. Dust with powdered sugar (optional). Cut into squares at room temperature. Serve with a scoop of ice cream. 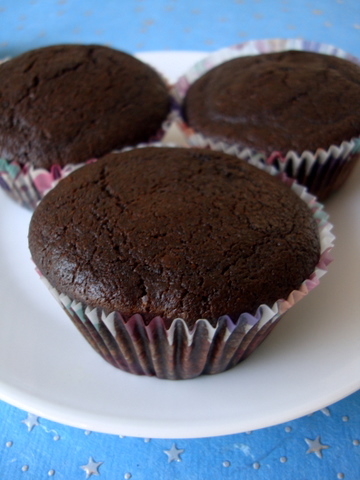 I spooned a part of the cocoa batter into cupcake liners till three fourth full and baked for 23 mts. This is a simple version of stuffed green chiles. Chana dal is soaked in water for sometime and ground into coarse paste along with other spices. Mild green chiles are stuffed with ground chana dal mixture and fried in little oil till golden brown in color. Stuffed green chiles is served with steamed rice and dollop of ghee. Makes: 5 – 7 Pieces of Stuffed Green Chiles. Wash the long green chiles with fresh water and pat them dry. Make a slit in the stomach of each green chile making sure the ends are intact. Soak chana dal in water for 4 – 5 hours and strain to retain the chana dal. Clean and finely chop the cilantro. Wash and mince the ginger. Grind green chiles and ginger into coarse paste using spice blender. Grind soaked chana dal with cumin seeds into thick and somewhat coarse paste adding minimum amount of water if necessary. For stuffing, mix together ground chana dal mixture, green chile ginger paste, red chili powder, tamarind pulp, cilantro and salt. Stuff each green chile with enough chana dal stuffing and keep aside. Heat oil in a pan, carefully arrange the stuffed green chiles and mix in any leftover stuffing. Fry the green chiles until they turn light golden brown. Turn the stuffed green chiles on other side and cook on this side till it turns golden brown in color. Remove stuffed green chiles onto a plate and serve with steamed rice and dollop of ghee. Notes: Make sure to choose the milder variety of green chiles. Suggestions: If the stuffing is not cooked properly, put them back into the pan and cook covered on low flame till done. If the green chiles are spicy then avoid using green chile paste and red chili powder. Variations: You can also vary the dal and spices to your preference. Other Names: Stuffed Green Chiles, Senagapappu koorina Mirapakayalu, Bharwan Mirchi. 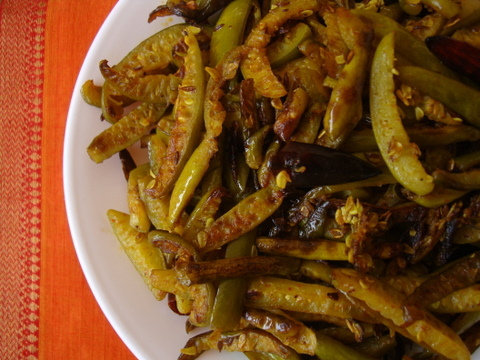 Tendli can be pickled just like carrots and green chiles. Tindora is cut into strips and soaked in lemon juice till they mature and turn acidic. Green chiles can also be added in the same jar for heat. Pickled tendli are generally eaten with rice mixed with some sort of dal / dhal or with yogurt rice. Makes: around 1 1/2 Cups of Tendli in Lemon Juice. Peel, remove little bit of both ends, wash and pat dry the tindora. Chop the tindora vertically twice. Remove stems, wash and pat dry the green chiles. Slit the green chiles and keep aside. In a non reactive jar, add lemon juice and salt. Then add sliced tindora and green chiles. Leave the tindora to mature for good 6 – 8 hours. The tindora lose their green color just like green chiles do. 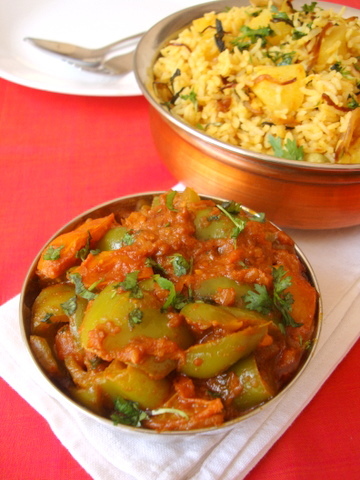 Serve pickled tindora with dal rice or with yogurt rice. Notes: Make sure not to add too much salt. Suggestions: If there is too much salt in the jar, stir in more lemon juice. Make sure to choose tender green chiles for milder spice level. Variations: You can also pickle the mango ginger and carrots in similar way. Other Names: Tindora in Lemon Juice, Pickled Tindora, Oora Vesina Dondakayalu. Here are 'not so sweet' whole wheat, orange flavored, berry pancakes that both kids and adults can enjoy. Mix the flour, salt, sugar and baking powder. Gradually add the juice and whisk to form a lump free batter. Then gently combine the berries. Heat a griddle or a shallow pan. Pour 1/4 cup batter and spread gently into a 4 - 5 inches circle. Drizzle a few drops of oil around the edges. Let it cook on low flame, covered. Cooking on low flame is important. 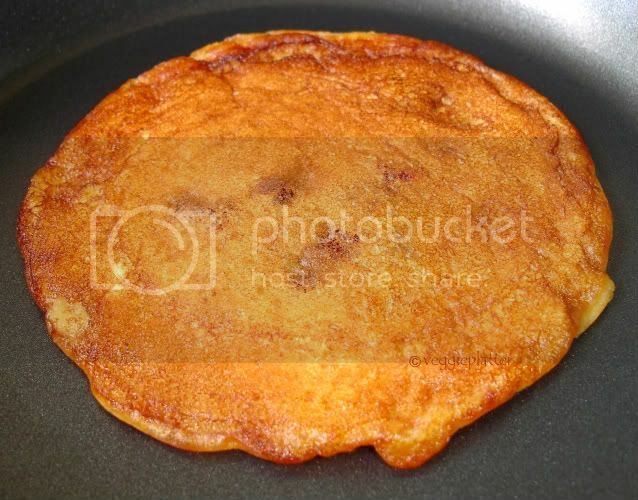 When it appears cooked, flip the pancake and cook for about 30 seconds or a little more when the other side too browns a little bit. 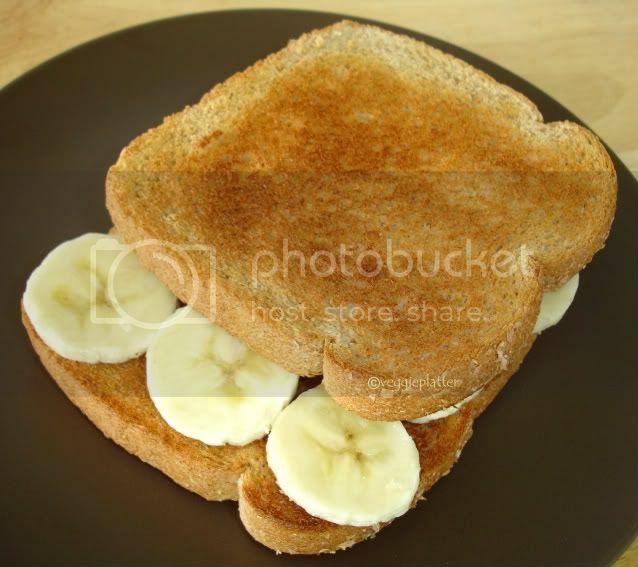 This is a family favorite and I prefer banana slices with toasted bread as a breakfast when I am feeling lazy. Any nut butter would be a healthy addition if serving kids. I am sending these over to Priya who is hosting Sharmi's 'Cooking with Kids' event this month, with the theme Whole wheat with fruits. I made vadiwale (or wadiwale or badiwale!) aloo tonight for dinner. 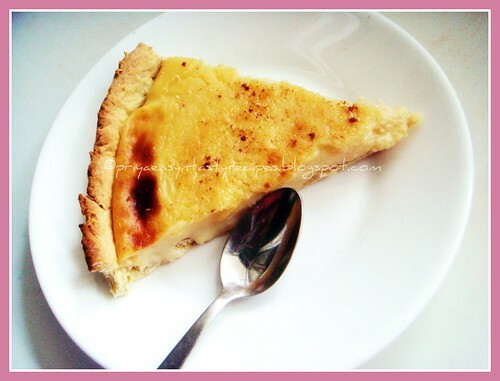 My recipe is simple and it will change every time depending on my whim and pantry. I may cut potatoes differently, use boiled potatoes, may add ginger-garlic paste, garnish with kasoori methi...each change will result in totally different flavor. I recently learnt a wonderful Kadhi recipe from my Punjabi friend where she adds fresh mint leaves after switching off the gas and then covers it with lid. I borrowed that trick and added fresh mint leaves from my kitchen garden. In a nutshell, this recipe may not be your authentic recipe. It will change with me and my many moods. 1. Heat oil in a saucepan. Add all the ingredients except onion. As they start spluttering, add onion. Saute till onion is soft. 2. Stir in tomatoes and wadies. Saute for 2 minutes. 3. Now add potatoes, 2 cups water, garam masala, paprika. Bring to boil. 4. Switch the gas to low. Cover partially with a lid. Cook till potatoes are soft but not mushy. 5. Add salt. Let it simmer till the desired consistency is reached. 1. Boiled potatoes can be used. 2. I used grape tomatoes because they were readily available in my refrigerator. Our sunday special goes for this green mint pulao cooked along with prawns..We love seafoods, been born and brought up in seashore city my favourite seafood always goes to prawns, i love to add some prawns even while cooking some veggies stir fries, but nowadays am trying to control myself to add prawns in my stir fries and trying to add oats to make them more healthier..Coming to this delicious, spicy seafood pulao goes for simple ingredients , its get ready within few minutes.. While cooking the aroma of this pulao itself tempts and makes everyone hungry, this pulao is one of our family favourite which i usually prepare simply with tomatoes but this time since i had a bunch of mint leaves i prepared them as mint flavoured prawn pulao, i served this delicious pulao along with simple cucumber raita and everyone at home enjoyed it much..
Soak rice for 15 minutes,drain the water and keep the rice in a colander, meanwhile grind all the ingredients given in the list 'To Grind' with enough water as fine paste...Heat enough oil in the pressure cooker and fry the whole spices, add the onions saute until they turns transculent, now add the ground masala,turmeric powder, garam masala powder and fry until the raw smell goes away..
A recipe you can serve at a potluck with any flavored rice or Naan or simple phulkas. 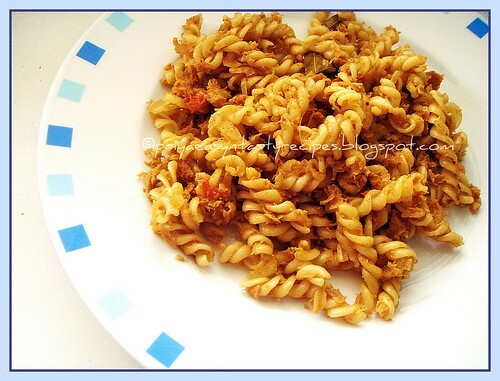 The nutty flavor of peanuts and sesame seeds mingles well with the tart taste of tomatoes and sweetness of capsicums. Do not omit kasuri methi as it adds a bright flavor to the dish. 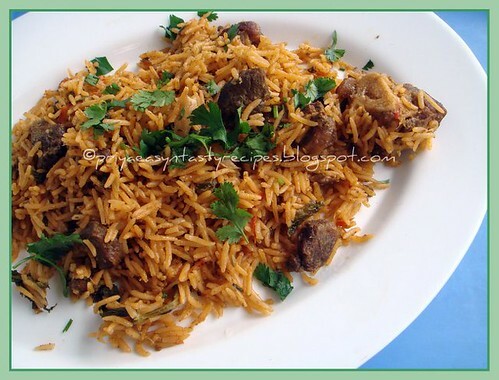 Makes for a good side with Aloo Biryani and comes together quick and easy. 1 Heat oil in a heavy bottomed vessel, add chopped onions and curry leaves and fry till onions turn transparent. Add ginger-garlic paste and saute for 3 mts. Add red chilli pwd, turmeric pwd, coriander pwd and salt and combine. Add the chopped capsicums and tomatoes and fry for 7-8 mts,without lid. 2 Add a cup of water and cook for approx 10-12 mts with lid on low to medium flame. Allow the gravy to thicken. 3 Add the ground nut and sesame seeds pwds and kasuri methi and combine. Cook without lid for 5 mts. Turn off heat. Remove onto serving bowl and garnish with chopped coriander leaves. 4 Serve with rice or rotis. There is something really good about Vizag weather since the past few days. Pleasant cool weather during peak summer season is very unusual and called for leisure vegetarian cooking with warming flavors. Aloo Biryani and Capsicum Tomato curry was our meal this afternoon. 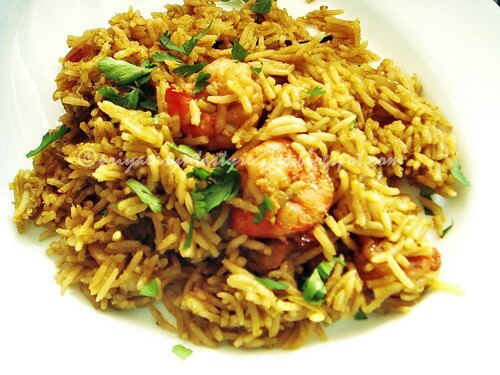 Every day ingredients are all you need to prepare Aloo Biryani and it takes less than an hour to prepare. Do garnish with caramelized onions for that extra oomph to the biryani. 1 In a bowl, add green chillis, mint leaves, coriander leaves and ginger garlic paste, red chilli pwd, turmeric pwd, coriander pwd, biryani masala pwd and salt and combine well. Add the sauteed potato cubes and yogurt and combine. Marinate for 30 mts. 2 Cook basmati rice in lots of water along with bay leaves, cloves, cinnamon, cardamom, marathi mogga, elaichi, mint leaves, oil and salt till its half cooked. Strain the water and spread the rice on a large wide plate. 3 Heat 1 tbsp oil + 1 tbsp ghee in a vessel, add sliced onions, saute for 8-10 mts till caramelized. Remove and keep aside. 4 Take a wide deep vessel to prepare the biryani. Add drizzle some oil all over, add the marinated potato cubes along with the rest of the marinade and spread out in the vessel. Add a cup of water and cook till the potatoes are fork tender and the gravy thickens. 6 Next spread the rice over the potato layer, pour 1/2 tbsp of ghee all over the rice, spread the caramelized onions (keep aside a tbsp of caramelized onions for garnish) over the rice layer. Next sprinkle coriander leaves and pour the saffron milk over the rice. 7 Place lid and over the lid place a heavy weight. Cook on medium high flame for 3 mts. Remove the vessel from fire and place a iron tawa over low flame. Place back the vessel on the iron tawa and cook on low flame and cook biryani for 15 mts. Turn off heat and do not remove lid for 5 mts. 8 Remove lid, combine gently, remove onto a serving bowl. 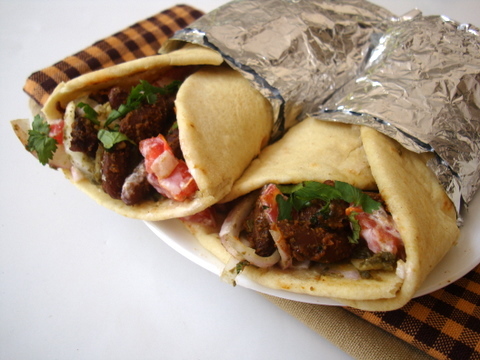 Garnish with chopped coriander leaves and caramelized onions and serve hot with raita and curry of your choice. I got some cherries at Pondy Bazaar in Chennai. Those cherries were special, as i handpicked them one by one, choosing the Best. I would usually buy a Pack of cherries, from the Vegetable shop, which will have only few good cherries in it. 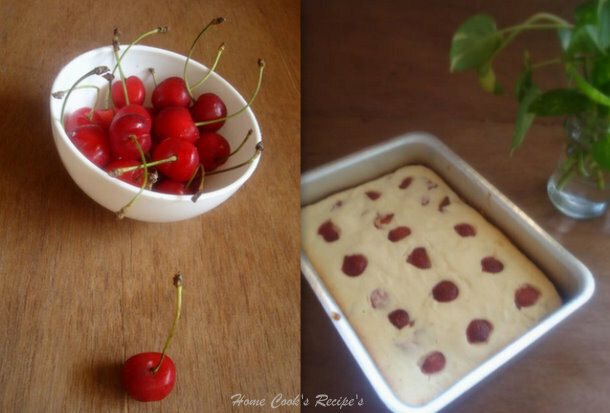 So having got such Rich Red Cherries, i wanted to make Cake out of it. There i baked this Cherry Cake, and it turned out Good. It will be so Perfect along a cup of Coffee. I tried the cherry cake from here. Pre-heat the oven at 350F / 180C. Grease a Baking Bowl with little butter and set aside. In a Mixing bowl, beat the butter and Sugar, till they turn creamy. Add Egg's one by one and beat well. Add Vanilla Essence to the bowl and mix. Add little Flour and mix with a wooden spoon. add flour and milk alternatively and keep mixing with the wooden spoon. Last, add the cherries to the bowl and mix. Reserve some cherry slices, to top, on the halfway of baking. Bake the Cake at 180C / 350 F for about 1 hour. In Between, remove the Cake from the oven and top with few left cherries and put back into the oven. Check the cake, by inserting a toothpick at the centre of the cake comes out clean. Its such a easy Cake to make. 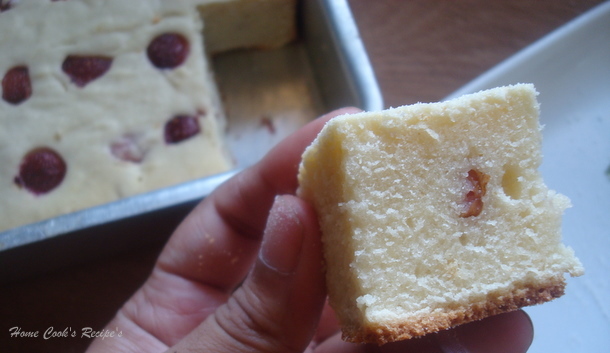 For me, it tasted like Pound Cake and the cherries gave a nice taste to the Cake. This Cherry Cake will be a Perfect Tea Time Snack. 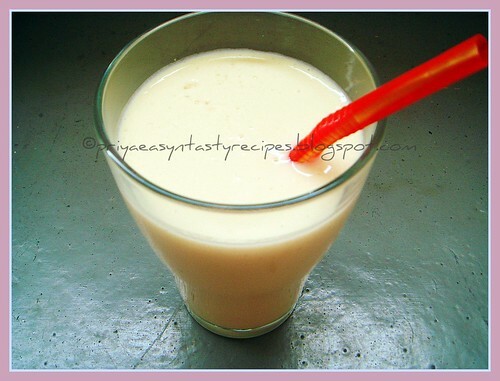 A nourishing, refreshing mango drink with the special flavor of rich and creamy coconut milk. 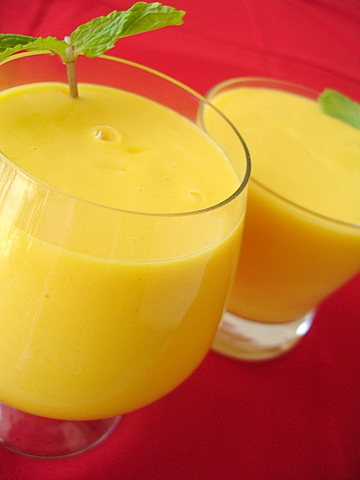 Vegans will relish this dairy-free, fiber rich mango lassi. Blend 2 cups of peeled and diced mangoes, few ice cubes, 1/2 cup thick coconut milk (increase for a thinner consistency) and honey or sugar as required. Pour into glasses and serve. Fresh flat beans are stringed and chopped into small pieces. They are then boiled in water till just cooked. 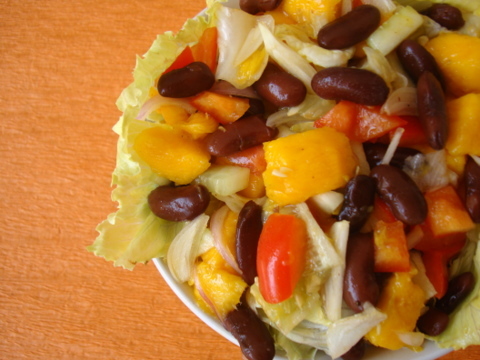 A spicy tomato onion gravy is prepared in the meanwhile and finally boiled beans are added to the gravy. This beans masala goes well with steamed rice or with pulka or roti. Makes: around 4 Servings of Flat Beans Masala. Other Names: Fresh Beans Masala, Masala Chikkudu. 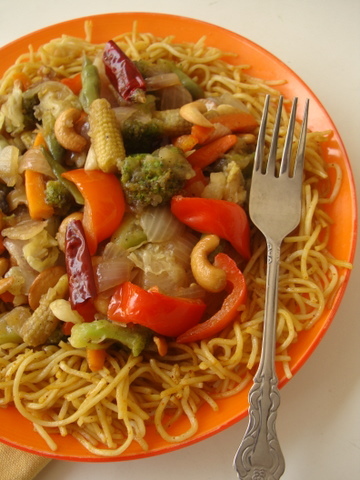 A light vegetarian stir fry dish that is flavorful, colorful, substantial and healthy. 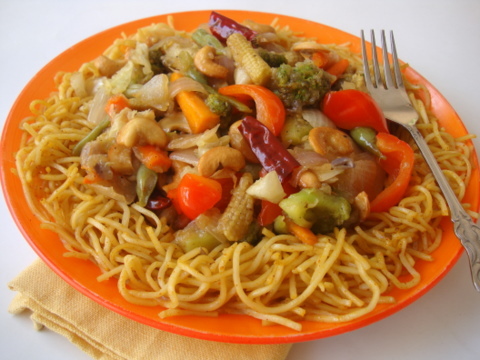 Serve the stir fried vegetables over a bed of fried noodles or steamed rice and enjoy the symphony of flavors and textures. Not to mention, your family get to eat their 5 a day portion of vegetables in a single meal. Most of our sunday's goes for special menu, today we guys are celebrating Mother's Day here, no doubt the day started very special today with a raspberry& oats shake prepared by my DH,bread toast with jam prepared by my princess as breakfast, both surprised me by waking me with these beautiful breakfast menu..No words to express how happy i am today, so i planned today to give an enormous treat to my sweet family by making out our favourite Chettinad Mutton Briyani, which i usually prepare in a kadai and finish by putting them in dum (in oven)..This time i wanted them to prepare in pressure cooker since they need very less time and the briyani will get ready in few minutes served along with cucumber and watermelon raita,this briyani tastes marvellous and we loved it..I went through Solai Aunty's Chettinad Mutton Briyani and i prepared exactly the same way she prepared her briyani..Thanks Aunty for this beautiful dish.. Meanwhile grind all the ingredients given in the list 'to grind' as fine paste..keep aside..Once the pressure get released, strain the mutton pieces and keep the mutton cooked water aside..Now heat a big pressure cooked with enough oil+ghee, fry the whole spices,fennel seeds until brown, add immediately the chopped onions, chopped tomatoes, saute for few minutes, now add the grounded masala,salt and saute until the raw smells goes away..add the mutton pieces,chopped mint and coriander leaves and cook everything well in simmer..
Measure the already cooked mutton water along with thick curd to make 4+1/2cups..pour this cooked mutton water-curd mixture to the cooking masala, bring this to boil..add the already prepared rice now to the boiling masala..close the cooker, once the pressure comes put the weight, keep the stove in low flame and cook for 10minutes (dont wait for the whistle)..Switch of the stove..once the pressure get released, mix gently and garnish with coriander leaves.. 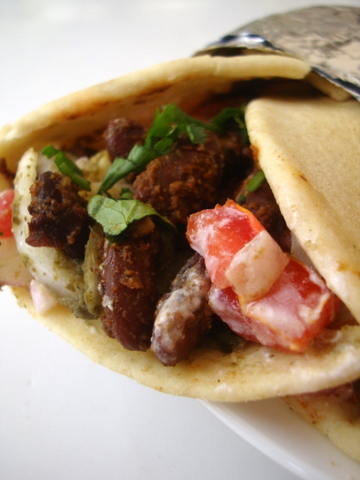 Serve hot with any raitas!! Raw papaya is a delicacy. Mom uses it to make bhaaji or koshimbeer. MIL uses it to make muthiya. 1. Mix grated papaya, salt, sugar - if using, powdered peanuts, lemon and chilies together in a bowl. 2. Heat oil in a small saucepan. Add the ingredients for tempering. 3. Drizzle the tempered oil over the salad. 4. Garnish with cilantro and coconut if using. 1. Do not use ripe papaya. This bhaaji can be made dry or with a little gravy. When carrying as a part of lunch box (PoLi-bhaaji cha daba), mom makes it dry. 1. Heat oil in a kadai or saucepan. Add all the ingredients for tempering. 2. As they sizzle, add drained moong daal. Saute for 3 minutes. Add bottle gourd pieces. Saute for 1 minute. 3. Add ground coconut paste, 1/2 cup water. Bring to boil. 4. Switch the gas to low. Cover partially with a lid. Check from time to time sothat the water is not evaporated. Let it cook till bottle gourd is soft. But daal should not be a complete mush. 5. Add salt to taste. Let it simmer for 5 minutes. 1. If you want a gravy, add more water or for dry subzi, let the water evaporate completely. Smoothies, these thick shakes are prefect to beat the heat, it has been a long i had smoothies with jackfruits, i often try to get either frozen jackfruits chunks or canned jackfruits pieces to make out either salads or simply for desserts drizzled with honey...We love these jackfruit that much, i prepared this simple but delicious smoothie which tastes awesome, this jackfruit smoothie wasnt that much strong in flavour either too sweet but very refreshing and absolutely prefect for hot summer...This time i used frozen jackfruit pieces for making out this beautiful smoothie..
Take the chopped jackfruit, yogurt, milk and maple syrup in a blender, blend everything as thick smoothie..serve immediately with ice cubes.. I rarely prepare pickles at home, before whenever we go to India or Indian groceries i'll pick atleast 4 or 5 bottles of variety pickles as my H love to have sambar rice or curd rice with pickles..Few years ago, lemon pickle wasnt that much easy and possible for me to prepare at home without hot summer, as i have been brought by seeing my mom used to keep her jar full of salted lemon pieces in the sun to get ready as pickles..But once i came here to Paris, sunny days are less when compared with cold and wintery days..Its quite a tough task to make those delicious tangy lemon pickles as the traditional way,i was pestering my mom to find out an alternative way to make out these pickles finally through my mom i learned this pressure cooker method for making out our favourite lemon pickles with less time at home..This pressure cooker method need just few minutes and the pickles will get ready to enjoy immediately, eventhough i prefer them to enjoy after two or three days...I prepared this spicy pickles yesterday at home and i wanted to share with you all friends..
Wash and pressure cook the lemons in a vessel without adding water upto two whistles..once the steam get released, let them get cooled completely and slice the lemons as small pieces..Add the red chilly powder and salt, toss until the lemon quarters get well coated..
Let them get cool completely and conserve them in a bottle..Enjoy this home made pickles anytime..
My last visit to the farmers market was really memorable. While I was browsing through the herbs pots, I came across this "Cuban Oregano". Though I didn't recognize this plant by the name cuban oregano, I knew it was owa. My grandmother used to make delicious fritters with those velvetty leaves. Last year, I even threw some owa/ajwain/ajmo seeds in the soil to see if I get those leaves. But instead, I got these leaves. Now, I know the difference. There are many different varieties of oregano family. Cook the soyagranules in water until they doubled their volume..drain the water and squeeze out the excess of water..Heat enough oil, fry the whole spices and add the chopped onions, chopped tomatoes and ginger garlic paste, saute everything well until the onions turns transculent..meanwhile grind the already cooked soya chunks as slightly coarse...Now add the grounded soya chunks,cumin powder, fennel seed powder, turmeric powder, chilly powder, garam masala powder and salt to the cooking veggies, put the flame in simmer, cook until the oil get separates..Finally add the cooked pasta, coriander leaves or curry leaves, toss everything gently and cook for few minutes simmer...put off the stove.. When Radhika of Food For 7 Stages Of Life send me an email with subject as Congratulation, i was bit nervous to open the mail and finally when i saw that am the mega winner of the FF7SL series, no words to express my joy and happiness , totally surprised to know that am the winner of FF7SL series, an awesome event went for several months with different themes..Whenever my foodie bloggers announce an event, i'll definitely try to send two or three entries to their event, its has been a ritual for me since i started my space..Thanks a ton to Radhika for this beautiful event and to the other winners of these series.. Am honoured to be a part of this beautiful event and am sooo happy.. 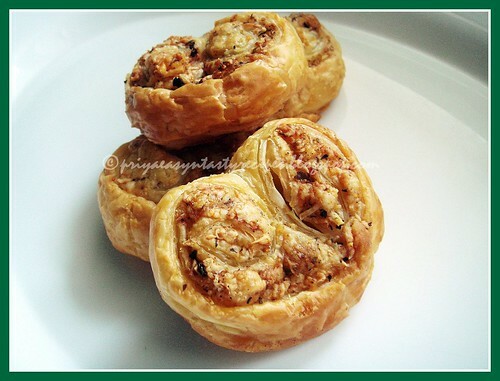 I have prepared this palmiers with grated mozzarella cheese, cumin powder and red chilly flakes before a month, this recipe was sitting in my draft and finally i wanted to post them today as i wanted to send my few entries to my own event, guest hosted by Sara as cumin seeds as this month's seed..This palmiers is quite easy to prepare and a prefect snacks to enjoy..We loved having this spicy version of palmiers for our snacks and the cumin seed powder i used changed completely the taste of this palmiers.. Roll the pastry sheet and springle the mozzarella cheese, dry parsley leaves, cumin seed powder,red chilly flakes and salt , fold on both sides to bring both edges to the middle and form like a log, arrange in freezer for 15minutes..Preheat the oven to 400F, cut the log as small pieces and arrange over a baking sheet lined over a baking tray, arrange the tray in the middle rack and bake for 12-15minutes.. Wonderful summer time wrap that is super simple to bring together. Light yet filling meal. Pack your child’s lunch box with these protein rich wraps or cut them and serve as appetizers at a party. 2 Heat oil in a vessel, add ginger green chilli paste and stir fry for few secs. Add the chilli pwd, coriander pwd, garam masala and salt and a tbsp of water. Add tomato ketchup and combine. Add cooked beans and few tbsps of water cook on low flame for 8-10 mts or till the water evaporates. Add kasuri methi and malai and combine well. Add chopped coriander leaves and turn off heat. 3 In a bowl, combine hung yogurt, salt and chopped tomato and cucumber and keep aside. 4 In a bowl, combine the raw sliced onions with few tbsps of green chutney and keep aside. 5 To prepare rotis, pinch a large lemon sized ball of dough, dust the working surface with some atta and roll out the stuffed dough to form 6″-7″ diameter circles. 6 Heat a iron tawa and once its hot, place a roti and let it cook lightly on both sides. Prepare all the rotis and place them in a casserole to keep soft. 7 At the time of serving, place a roti on a plate, spoon 1 1/2 tbsps of yogurt-tomato mixture, followed by the onion-green chutney mixture. Next, spoon the curried beans, sprinkle coriander leaves, finish off with a dash of lemon juice and roll the roti tightly to form a wrap. Wrap the lower part of the wrap in butter paper, aluminum foil or tissue. Freshly shelled corn is fried in little ghee and cooked in milk till soft. Then ground poppy seeds paste is added to the corn and reduced till it comes together. Finally garam masala is added to it before removing from heat. Serve creamy corn masala with roti, pulka etc. Makes: around 4 Servings of Creamy Corn Masala. If the corn is not too soft, cook for some more time. Notes: Make sure to soak the poppy seeds well. Suggestions: If the corn is not cooked well, put back on heat and cook for few more minutes till done. Variations: You can also check out corn capsicum masala, Corn and Fenugreek Leaves in Creamy Sauce. Other Names: Creamy Corn Masala. 2. Shift the mango slices in a wide bowl add half salt and turmeric powder combine well to coat salt and turmeric each and every piece. 3. Cover this marinated mango pieces bowl with a lid and leave a side for 1 day. 4.Next day morning you can find this marinated mango pieces ooze there juices. Now squeeze the juice lightly from mango pieces and spread the mango pieces on a big plate. 5. Sun dry this squeezed mango pieces with sap in a very hot sun for 1 day or till the wetness in the mango piece disappears. (this process will take 1 day in Indian peak summer ). 6. In the mean while dry roast the mustard and then fenugreek take care that the seeds should not splutter remove and make a fine powder. 7. Add remaining salt.red chili powder, mustard and fenugreek powder, sap to mango pieces mix well to combine every thing. 8.Heat oil in a deep frying pan add mustard seeds let them splutter then add broken red chilies and asafoetida remove from flame and let it cool. 9 Add this seasoning to mango and spice mixture mix well to combine every thing leave it for a day. From third day you can use this pickle. 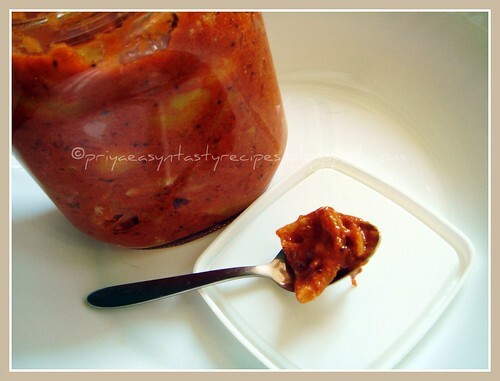 Enjoy this delicious pickle with curd rice or pongali or even with plain steamed rice. Make sure that you don't touch water while making the pickle and clean each and every thing like mixing bowl ladle and mangoes with a dry cloth and dry them properly. Use a clean and dry spoon every time to take out the pickle from jar. 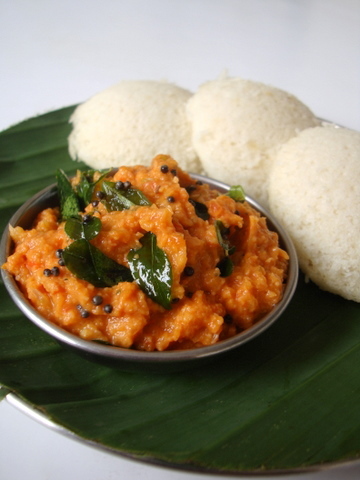 This rubbina pulusu can be loosely described as another variation of the famous South Indian sambhar. Though spices are used both in sambhar and this dal preparation, how they are used makes all the difference. While the spices are toasted and ground dry in the sambhar case, rubbina pulusu uses the wet paste of spices and this variation makes these two dals entirely different taste / flavor and texture wise. Unlike sambhar, this dal should be on the thicker side. The ground paste of spices - coconut forms a delicious, thicker sauce / base to the preparation and so a small quantity of toor dal is enough to prepare this dish. The fresh ingredients used in this pulusu makes it a delectable dal. 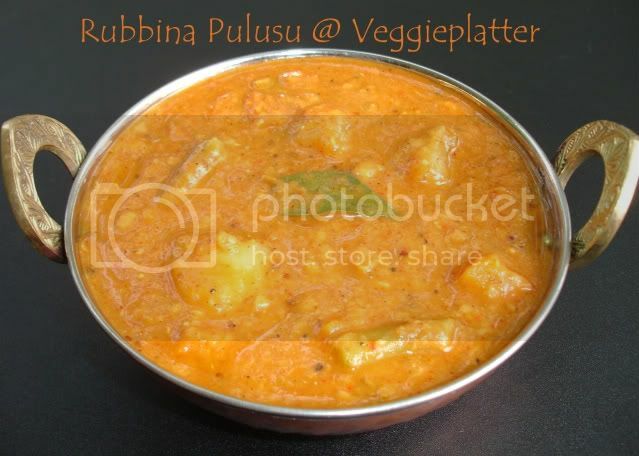 I personally prefer this rubbina pulusu any day to sambhar. In Telugu, rubbina means ground and pulusu is dal. * Wash the toordal and throw away the cloudy water. Then add toordal, vegetables, turmeric powder and about a cup of water to a container. Place the container in a pressure cooker and cook. * Soak the tamarind in little water. * Meanwhile, Add chanadal and uraddal to a small sauté pan and toast on medium flame. When they start to turn reddish, add coriander seeds, cinnamon pieces, moggu, chilies to the pan and toast them as well. Allow them to cool. * Grind the toasted spices, coconut, tamarind into a paste adding water as needed. * Add the ground paste, salt to the cooked dal - vegetable mixture. The consistency of this dal should be thicker. Add some water if needed. Bring the mixture to a boil and let it simmer for about 10 minutes. * Heat oil in a small sauté pan and add mustard seeds and cumin seeds. When mustard starts to pop and cumin starts to sizzle, add asafoetida & curry leaves and turn off the stove. * Add the tadka mixture to the cooked dal and mix well. Tindora / Dondakaya / Gherkin is either chopped horizontally or vertically. Oil is tempered with spices and tindora is fried till light brown in color. Then ground tamarind paste is added and briefly cooked. 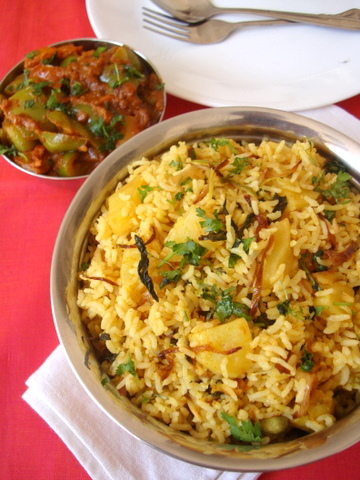 Sour tindora is generally served with dal rice or yogurt rice. Makes: around 2 Servings of Sour Tindora. Wash tindora under fresh water. Remove ends and chop tindora into thick circles. Soak tamarind in a tbsp or more of water and extract thick pulp. Grind tamarind, green chiles, cumin seeds and salt into paste. Then stir in chopped tindora and salt. Cook covered for few minutes until tindora is little soft. Uncover and fry till tindora turns light brown around the edges. Stir in tamarind green chile paste and cook for another minute or two. Serve sour tindora with plain steamed rice or with dal rice. Suggestions: Adjust the sourness if the curry with tamarind. Variations: You can also add chopped cilantro while grinding the green chiles. Lemon juice can also be added in place of the tamarind. Other Names: Sour Tindora, Pulusu Dondakaya. Less is more. This tindora/ivy gourd recipe walks away a winner with the minimal of ingredients and a flavor to die for. 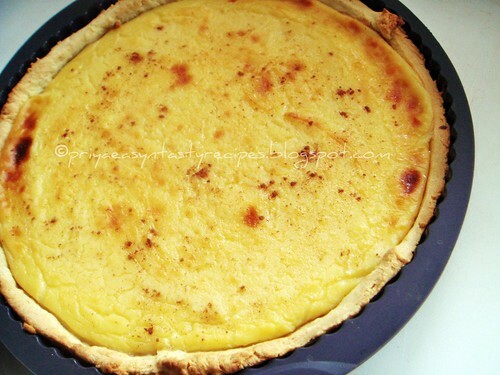 I love the simplicity of this recipe and how comforting it is to the palate. Amchur or raw mango powder is what gives the tindora a boost of flavor. So, do use amchur if you make this stir fry. And, seriously, you should prepare it. Makes for a good side with roti or rice and dal. 1 Wash the tindora and nip the tip and tail ends. Slit each ivy gourd into two, length wise and slice them into thin long strips. 2 Heat oil in a cooking vessel. Once the oil is hot, reduce heat to medium flame, add the cumin seeds and let them splutter and turn brown. Add hing and fry for a few seconds till the aroma emanates the kitchen. 3 Immediately add the sliced tindora and combine. Add salt and turmeric pwd and mix well. Saute on medium heat for 3-4 minutes, keep sauteing so that it doesn’t burn. Now reduce to low flame, place lid, let it cook, approx 15-18 minutes. Keep checking in between, sauteing them so that they don’t burn. The sauteed tindora will lose moisture and begin to have a wrinkled appearance. 4 Remove lid, and cook on low-medium flame for another 20-25 mts. The tindora should retain that, slight crunchy texture. Add amchur pwd and garam masala and combine. Turn off heat. 5 Finally, adjust the salt and serve hot with steamed rice. 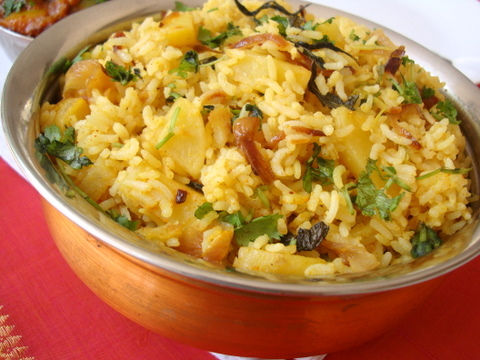 Steamed rice or leftover rice is tempered with urad dal and spices. Mustard seeds are powdered and mixed with tempered rice along other spices. This is a quick and easy rice dish that gives a lot of heat. Ava annam is usually served with big scoops of yogurt aside or with cucumber raita. Makes: around 2 Servings of Hot Mustard Rice. Grind mustard seeds, red chile powder and salt into fine powder using a spice blender. Heat oil in a pan, add all talimpu ingredients in order along with green chiles. When urad dal changes color, stir in rice and remove from heat. Now stir in ground mustard seeds powder. Taste and adjust the seasoning if necessary and keep covered for around 10 mintues. Serve hot mustard seeds rice with any raita or with a glass of buttermilk. Notes: Make sure not to cook the rice once the mustard seeds powder is added. Suggestions: If the rice is not spicy enough, add more green chiles or the red chile powder. Variations: You can also use leftover rice in the same method. Other Names: Hot Mustard Rice, Ava Annam, Rai Chawal, Ava Pettina Annam. 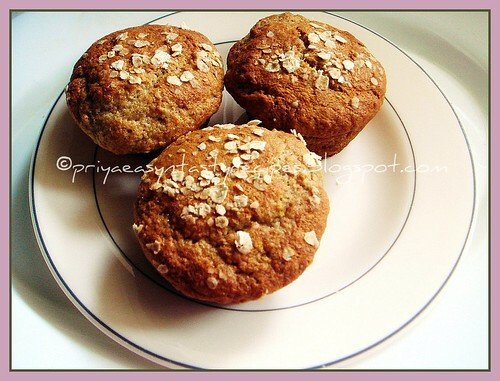 Healthy banana muffins which suits prefectly for a lazy morning breakfast and for a simple evening snacks..I prepared these muffins today with whole wheat flour, rolled oats,almond powder, mashed banana puree, this muffins are low fat, eggless at the same time they were really soft,moist and tasty...This muffins vanished within few minutes, that too we loved having them when these muffins were still warm..Quick muffins suits prefect to carry even for picnics or for lunch box...A fabulous kid's friendly snack, am sending to CFK-WWF guest hosted by Priya, event by Sharmi & to Champa's Bake Off..
Preheat the oven to 350F..Take the whole wheat flour, rolled oats,baking powder, baking soda, almond powder in a bowl, mix the mashed banana,oil,sugar and milk with a wooden spoon in a another bowl until the sugar gets dissolved..gently fold the dry ingredients to the wet ingredients, dont overmix the batter else the muffins will turn hard..Spoon the batter to the muffin tins springle few oats on the top and bake for 20-25minutes until a toothpick inserted in the center comes out clean..Let them cool..
Melktert is a traditional tart of South Africa eventhough they have their origin from the Dutch which is quite easy and delicious tart to enjoy anytime, this milk tart is a sweet pastry crust containing a creamy filling made usually with milk, flour, sugar and eggs...The eggs used in this tart give a light texture and a stronger milk flavour to this tart and this recipe goes for a custard prepared already in stove top and then baked in the crust in oven..Some used to springle cinnamom powder while others goes for powdered sugar and cinnamon powder together..This melktert suits prefects for a party menu also a fabulous dessert..We enjoyed having this tart and i prepared them from the scratch eventhough for the crust u can go for storebought pastry sheet...Sending to Champa's Bake Off..
Whisk the butter and sugar until they turns fluffy, add the flour,baking powder, salt and mix everything with fingers until they turns moist and crumbled like dough..mix in the beaten egg and turn everything as soft dough,close with a kitchen towel and arrange in fridge for an hour.. Melt the butter in milk over medium heat.. beat the eggs, sugar and vanilla and gradually add the cornflour, whisk everything well..Add slowly the hot milk to the egg mixture, stir continously to avoid eggs from scrambling, mix everything well...Cook this milk-egg mixture in simmer over the stove top until this mixture gets thick..put off the stove and let this mixture get cooled (stir in between)..
Preheat the oven to 350F, roll the dough with rolling pin in a floured surface, line the tart mould with a baking sheet, arrange the rolled dough over the lined sheet and prick the dough with a fork..Now pour the egg mixture into the tart shell, sprinkle the surface with sugar and cinnamon powder and bake for 30minutes in middle rack..
Dalia / roasted gram is powdered along with other spices and made into wet powder with tamarind and oil. Ridge gourd is slightly scraped leaving most of its skin intact and stuffed with prepared dalia mixture. The stuffed ridge gourd is cooked on low flame till its soft. Serve this stuffed ridge gourd with steamed rice and dollop of ghee. Makes: around 10 pieces of Dalia Stuffed Ridge Gourd. Lightly scrape, remove ends, wash and chop ridge gourd into 2 inch long cylinders. Make a slit in each ridge gourd vertically twice and keep aside. Soak tamarind in few tablespoons of water and extract all the thick pulp. Grind dalia, dry coconut, coriander seeds, cumin seeds, whole red chiles, red chile powder, turmeric powder and salt into fine powder without adding any water. In a small mixing bowl, mix together ground dalia powder, tamarind extract and oil. Stuff each ridge gourd cylinder with at least tablespoon of the prepared dalia powder. Heat oil in a pan on medium heat, add all talimpu ingredients in order. When mustard seeds start spluttering, arrange the stuffed ridge gourd in the pan. Add few splashes of water into the pan and cook covered on low flame for around 5 minutes. Turn the ridge gourd on other side, add another splash of water and cook covered on low flame for another 3 – 5 minutes. When ridge gourd turns soft but not mushy, uncover and fry for a minute or two to roast the outer skin a bit. Stir in any remaining dalia powder, chopped cilantro and remove from heat. 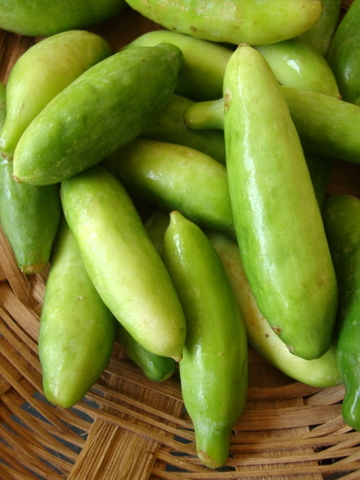 Serve dalia stuffed ridge gourd with steamed rice or with roti. Notes: Make sure ridge gourd is cooked properly before removing from heat. 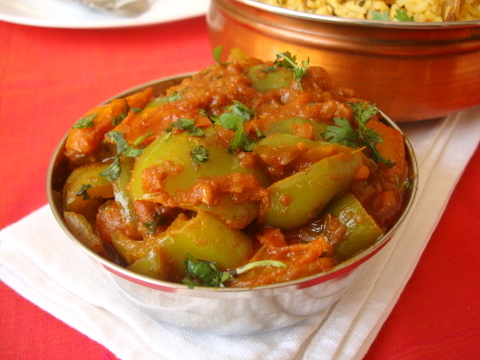 Suggestions: If ridge gourd is not cooked properly, put the curry back on heat. Add few tablespoons of water and cook covered on low flame till done.